Dublin, 17th April 2019 ALONE, the charity that supports older people to age at home, has welcomed the Government’s announcement of a €3 million fund, separate to the mental fund, which will be used to combat loneliness across Ireland. The move is welcome recognition from this Government of the seriousness of loneliness as a health issue and highlights the willingness to tackle it. ALONE CEO, Seán Moynihan, collaborated with Senator Keith Swanick to form the Loneliness Taskforce, an initiative to coordinate a response to loneliness and social isolation in Ireland. The Loneliness Taskforce endeavours to increase awareness about the issue and to achieve the implementation of a set of recommendations set out for Government, state agencies and all policy makers. Considering loneliness and social isolation as one of the greatest public health risks today, the charity was grateful for a productive discussion with Minister Daly held in the Seanad recently and was glad to see the support for this issue and discussion points taken on board. The Loneliness Taskforce was established by Senator Keith Swanick in collaboration with the CEO of ALONE, Seán Moynihan, to coordinate a response to the epidemic of loneliness and social isolation in Ireland. Members of the Taskforce include Professor John Hillery, Justin McNulty MLA, Professor Brian Lawlor, Dr Eddie Murphy, Professor Roger O’Sullivan, Sabrina McEntee, Sinead Dooley, Anne Lynott and Sean Gallagher. Dublin 16th April 2019 ALONE, the charity which supports older people to age at home, has partnered with the Irish Gerontological Society to present a symposium titled ‘Living Well in Our Community – Opportunities and Challenges’. The event will take place in the Education Centre of St Vincent’s Hospital, Dublin, on 17th May. Friend of ALONE, broadcaster Vincent Browne will moderate the seminar which will examine the issues facing Irish society as our ageing population continues to increase. Experts from the Department of Health, Social Justice Ireland, St Vincent’s Hospital, Connolly Hospital, Beaumont Hospital and St James’ Hospital will share insights and suggest solutions to better provide support for older people. With over 1.2 million people to be aged over 60 in Ireland by 2032, ALONE and the Irish Gerontological Society believe that now is the time to discuss and plan how Ireland will support our ageing population. Speakers on the day will include Colette Bennett, Research and Policy Analyst, Social Justice Ireland; Karl Duff, Department of Health; Dr. Graham Hughes, Consultant Geriatrician, St. Vincent’s Hospital; Dr. Siobhán Kennelly, Consultant Geriatrician, Connolly Hospital; Professor Brian Lawlor, Consultant Psychiatrist, St. James’s Hospital; Seán Moynihan, Chief Executive Officer, ALONE; Ciara O’Reilly, Clinical Specialist Physiotherapist, Beaumont Hospital; and Dr. Diarmuid O’Shea, President, Irish Gerontological Society. Seán Moynihan, CEO of ALONE, will discuss the importance of linking health and community services to best support those in need. “We are delighted to partner with the Irish Gerontological Society to present this symposium next month. I’m looking forward to an engaging session with experts dedicated to tackling the challenges we face in supporting older people across Ireland,” he said. The announcement of the symposium comes following the recording of the highest ever number of patients waiting on trolleys in an Irish hospital in University Hospital Limerick last week. “Hospital overcrowding is one such challenge we consistently face in supporting people to live well in their community. Events like this symposium give us the opportunity to broaden the discussion and find innovative solutions for issues like these,” Moynihan continued. Dr Diarmuid O’Shea, Irish Gerontological Society President, said, “ALONE’s partnership on this event and the engagement from participating speakers have been instrumental for providing an informed and rounded discussion on all aspects pertaining to older people. We’re looking forward to a stimulating day in St Vincent’s Hospital next month and to welcoming a multi-disciplinary audience to discuss and engage with these important issues. Dublin, 27th February 2019 ALONE, the charity that supports older people to age at home, has told Minister for Older People, Jim Daly TD, that they have welcomed the policy statement ‘Housing Options for Our Ageing Population’ published today, as he paid a visit to the ALONE office this morning. Minister Daly visited ALONE’s head office to view the charity’s assistive technology to support older people to age at home for longer. A collaborative project between the Departments of Housing and Health, the policy statement examines housing options for older people in Ireland. He continued, “We are encouraged by the report’s recommendation to purpose build 30% of new houses to accommodate the country’s ageing population and to ensure that half of all new apartment developments align with the needs of older people and those with mobility issues. As we develop these supported housing options, it is also important to be conscious of community and social inclusion for older people,” he continued. With first hand experience in providing housing for older people, ALONE has campaigned for a wide range of housing options to cater to the life-cycle and better match the level of care needed for people who want to remain living independently. According to ALONE’s own housing report, ‘Housing Choices for Older People: Time for Action’ released last year, building one- and two-bedroom homes for older people can increase their housing options and help to mitigate the housing crisis among larger families, saving money in building costs for larger homes. The charity welcomed the Government’s research into ‘right-sizing’ which indicated that with incentives, 15% of older people would consider moving to a different home in their community. Click for more information on ALONE’s report ‘Housing Choices for Older People in Ireland – Time for Action’. Established in 1977, ALONE supports older people to age at home. ALONE works with those who have issues with loneliness and social isolation, lack of services, poor health, poverty, homelessness or housing. ALONE provides Support Coordination, Housing with Support, Befriending and Campaigning services to over 1,000 older people nationwide every week.ALONE’s services are quality approved and are delivered 365 days a year. Dublin, 27th February 2019 The Minister for Older People, Jim Daly, today visited the office of ALONE, the charity which supports older people to age at home, to meet with the team bringing BConnect assistive technology to older people. Developed to support older people to continue living independently for longer, ALONE will roll out their technology to more than 270 older people this year, with a focus on rural areas. The app and technology enables older people to stay linked in with support services, self-monitor their health and activity, and feel secure and supported in their home. The technology includes ALONE’s BWell app, home sensors, a smart watch and alarm button. BConnect is developed by ALONE in partnership with Netwell CASALA and with support from the Social Innovation Fund’s THINKTECH grant. It is the first platform of its kind which ties together the older person, volunteers, family and healthcare professionals through one data management system. ALONE hopes that BConnect will revolutionise ageing at home and in the community. The technology will shortly be rolled out to a group of 60 older people living in Galway, Mayo and Roscommon with funding received under the Dormant Accounts Fund Action Plan 2018. The BConnect platform has already won the first ever FreedomTech Award 2017 at a conference on assistive technology. Dublin. The FreedomTech Assembly was run by Enable Ireland and the Disability Federation of Ireland (DFI). 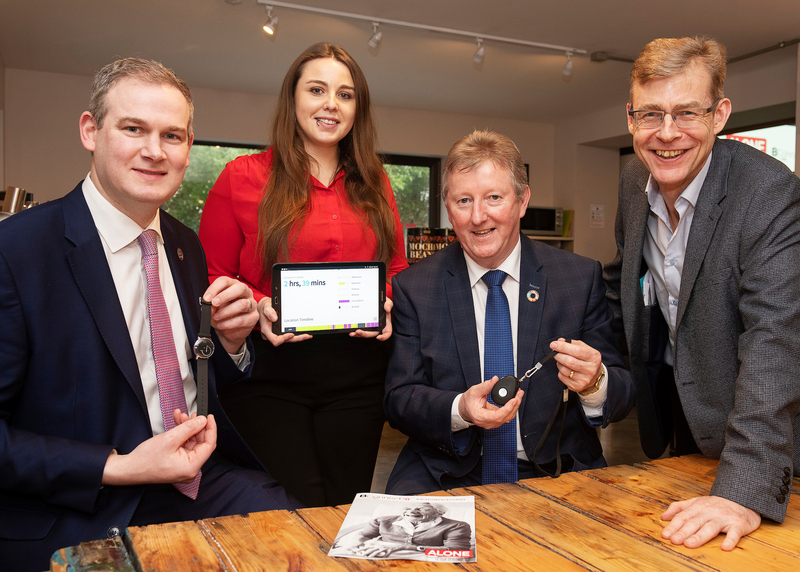 Galway, 22nd February 2019 ALONE, the charity which supports older people to age at home, has announced a pilot programme to provide its BConnect supportive technology to 60 older people in Galway, Mayo and Roscommon. The programme was launched by Minister of State at the Department of Rural and Community Development, Seán Canney TD, in the PorterShed, Galway today. Funding of €169,365 received under the Dormant Accounts Fund Action Plan 2018 will be used to provide ALONE’s BConnect technology and support to 60 older people who use the services of Clúid and St Vincent de Paul. Every older person will be provided with a tablet with ALONE’s BWell app, and will have smart home technology (BHome) installed, which will enable them to stay linked in with support services, self-monitor their health and activity, and feel secure and supported in their home. The funds will also support the position of Community Coordinator, who will engage with local community organisations and work with both new and existing befriending and support services in Galway, Mayo and Roscommon. It is hoped that the learnings from the pilot will be used to make ALONE’s BConnect technology available across the country. ALONE BConnect provides technology and community supports to create connections between older people and the support organisations they need. BConnect offers smart technology, knowledge-sharing, and training opportunities to support people to live independently at home. ALONE’s most recent Annual Report cited a sizable growth in the demand for its services, echoing Ireland’s rapidly changing demographic and the continued difficulties faced by older people across the country. With over 1.2 million people to be aged over 60 in Ireland by 2032, the need for services to support older people will only grow. Seán Kyne TD is Government Chief Whip and Minister of State for the Irish Language, the Gaeltacht and the Islands, Sophie Ainscough, BConnect manager, Seán Canney TD, Minister of State for the Department of Rural and Community Development and Seán Moynihan, CEO of ALONE. We will be closed on bank holidays, but open throughout the rest of the Christmas period. Call us on (01) 6791032 or email hello@alone.ie if you need support. 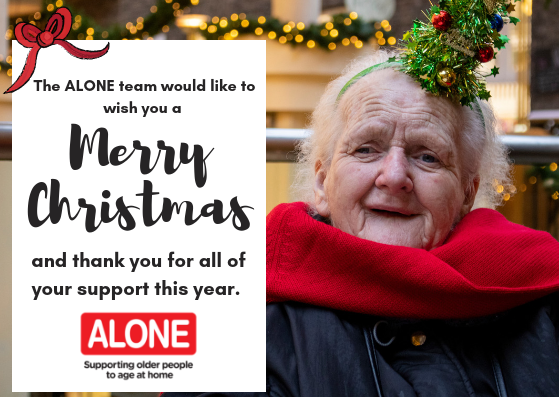 Dublin, 19th December 2018 ALONE, the charity that supports older people to age at home, is asking members of the public to give the gift of friendship this Christmas and into the New Year. The charity is asking the public to help older people living alone by reaching out to their older neighbours and friends, by donating to ALONE, or by becoming a Befriending volunteer. The charity is also urging older people experiencing loneliness to get in touch with them for help. ALONE say that there are a number of ways the public can help an older person, starting with reaching out to an older person for a conversation. However, the charity is urging the public not to forget about the older people in their lives after the festive season.